to meet the new requirements of the BRC Food Safety standard – issue 8? We have created a pack that provides you with everything you’ll need! We’ve got BRC culture covered! This pack has been designed to make implementing the changes for issue 8, as easy as possible. The implementation of BRC culture into the standard isn’t an easy thing to tackle. But in true Techni-K style, we’ve explained it in a way in which you can understand. And, we’ve provided you with 5 steps to go through to work out your BRC culture plan. Plus, we now need to implement a whistleblowing system (or ‘confidential reporting system’ as BRC call it – to make things a little more confusing) – so we’ve covered that for you too! Because these two new elements are part of the Section 1 Management Commitment, we thought we might as well do it all. So, this pack includes everything you need to complete your monthly and annual reviews. Plus, it covers organisation structure, responsibilities and authorities. 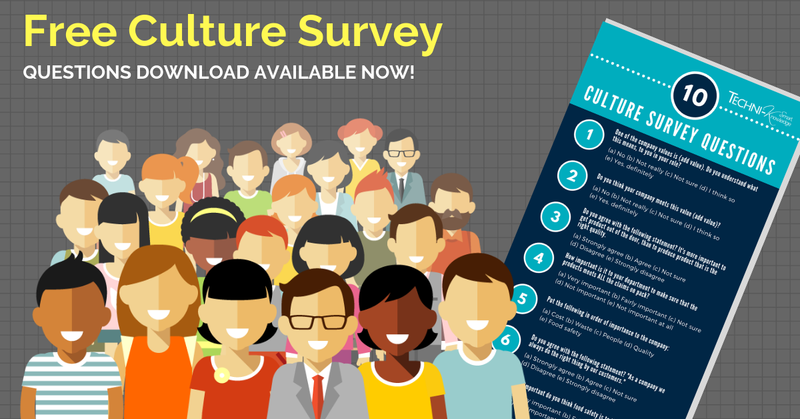 If you’d like a download of our 10 Culture Survey Questions, just complete the form below and we’ll email it to you. You will then be added to our BRC Culture list so we can update you about our solutions for this area of compliance within BRC Issue 8. We are so confident you’ll be pleased with your BRC Culture Pack to meet Section 1 Management Commitment & find it excellent value for money – but if not, simply email us to get a full refund – we offer a 30-day money back guarantee. We’ll be here for you – if you have questions while you’re implementing your new pack – just call or email us!